Much is made of Antarctica’s incredible wildlife: throngs of krill; seals piled together like rolls of carpet; regiments of penguins; whales puffing clouds into the sky. But there’s a creature arguably more incredible right outside our door here at Palmer Station. In fact, if you leave the door open by mistake, it’s likely to come inside and have a look around. It’s a bird called a snowy sheathbill, and some call it the largest land animal in Antarctica. It hurries toward you on stout gray legs, looking like a cross between a pigeon and a chicken. It seems fearless as it walks to within a yard of you and looks up with an inquisitive black eye. Or you’ll glance up to find a pair of them waiting on the eaves of a building, as if holding on to the silent knowledge that eventually, you will drop something edible. Chris is a professional photographer based in Seattle, Washington. 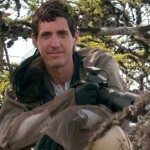 He uses photography as a tool to educate and inspire the public about science and conservation issues. Hi. Its Kaitlyn again. Has any of these animals interfered with the system, and how would you fix it?